Predominately based in the Church of St Michael and All Angels in the village of Lower Machen, concerts take place in the church which dates back to 1102 and is one of the most acoustically perfect buildings in South Wales. The spectacular gardens of neighbouring Machen House are open to the public during the interval. Lower Machen itself is a rural idyll -just nineteen houses (no shop, not even a pub!) but the audience comes from across the UK to experience the festival and the whole village volunteer to take part to make the festival a success. Ambitious plans for this year’s festival include 50 events in the 50th anniversary year. The festival launch concert took place in St David’s Hall on Tuesday 9th May and then the main festival in June takes place over an extended period from 15th – 25th June. Further events are planned for the second half of the year. Audiences voted for their favourite artist from previous festivals to perform in the festival and Voces8, winner of the audience choice vote will bring the main festival to a close. We are pleased to be welcoming many returning artists this years including pianist Lucy Parham and Actors Martin Jarvis and Rosalind Ayres in the final programme of the composer portrait series, Michael Collins clarinet, the Lower Machen Festival Singers and a family concert given by Bach to Baby. Central to the festival will be the Fernstein Ensemble performing all of Bach’s six Brandenburg Concertos over two concerts on 18th June. New performers include Caritas Chamber Choir and the Castalian Quartet. Musical tributes will take place to honour the work of Robert Maskrey and Peter Reynolds former Chair and Artistic Director who both passed away suddenly last year. Additionally, the festival is going to put on events in places where classical music isn’t normally found for example a Shoppers Messiah to engage with as wide a public as possible and to give the festival a presence throughout the year. The festival is fortunate to have received Lottery Funding from the Arts Council of Wales to which it is most grateful to enable the ambitious programming to take place. Our festival commission by Nicola leFanu has been supported by the Cohen Foundation and we are also grateful for support from RVW Trust. The festival still needs to raise a considerable amount to fund the projects and a 50th anniversary friends scheme has been launched inviting supporters to donate £50 to support the festival. “We are extremely pleased to have reached the milestone of the 50 years in what is a difficult climate to secure funding for arts festivals. To celebrate this event we aim to put on 50 events to engage with as wide a section of the public as possible and to give the festival a presence beyond the annual week in June. “The festival launch was an exciting event which took place in St David’ shall on Tuesday 9th May. 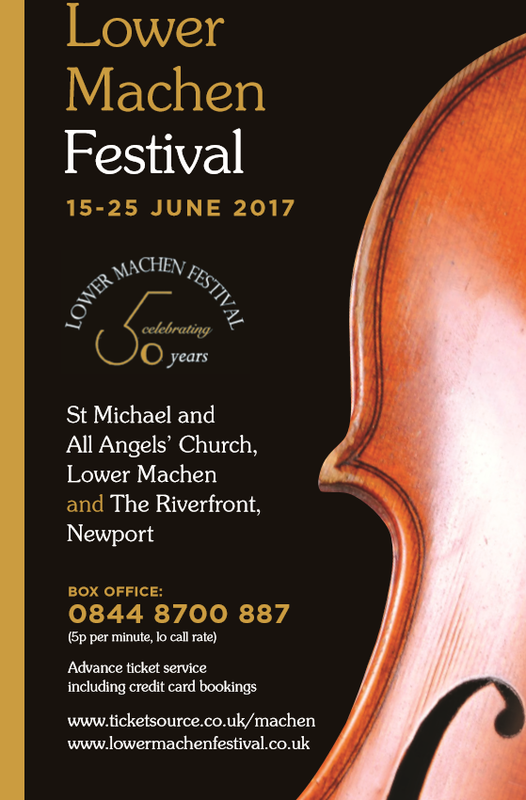 Featuring Matthew Jones violin with the Welsh Chamber Players the performance of Vivaldi’s Four Seasons reflected the “year long” presence of the festival in the 50th Anniversary years. Tickets start at £1 for under 16s and are available from www.ticketsource.co.uk/machen.